Diagram A. 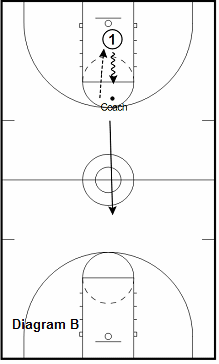 Coach and player slide to half court and back passing 2 balls. Diagram B. While dribbling down the court, the player pass and catches the tennis ball from the coach. This can also be done using a retreat dribble. 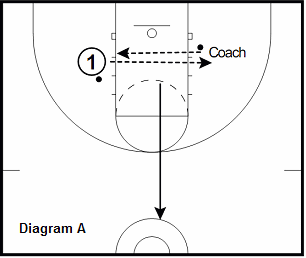 Diagram C. Player catches and goes into 2 steps and shoots floater from all angles. Make 20 with last 5 in a row. **Taking away the dribble allows the player to focus on footwork and release. 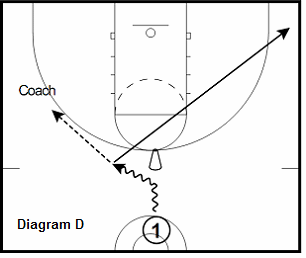 Diagram D. 1 makes a move on the cone and makes a air pass off the dribble to the coach. After passing they cut to the opposite corner. 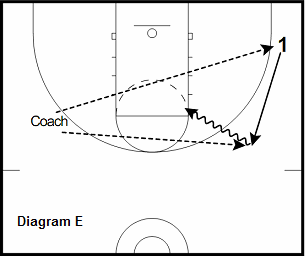 Diagram E. Coach then gives 1 a skip pass for a catch and shoot. After the shot 1 flashes to the top for a one dribble jump shot. 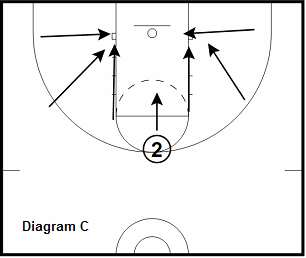 Diagram F. Player uses chair into high pick and roll series. Shots: vs soft hedge, vs hard hedge, split screen, vs ice, shoot behind the screen, reject screen, elbow bounce out, put in jail, attack the switch. 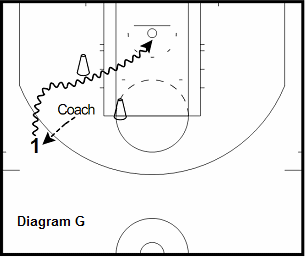 Diagram G. Coach passes to player. 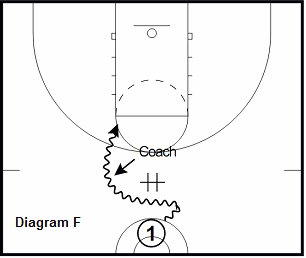 Player quickly reads coach's foot and attacks then makes move on cone (help defense). Progression: 1 dribble jump shot.